This question is now answered in a Blue Solution about Smartphone Apps in marine resource management on the Panorama Platform. Managing marine resources heavily relies on data, while globally and in many settings in Pacific Island countries a lack thereof remains. Manual, paper based reporting system are widely used, even though these are typically burdensome, resource intensive and error-prone. Furthermore, data often remains locked away in spreadsheets and results are not measurable, visible or accessible. 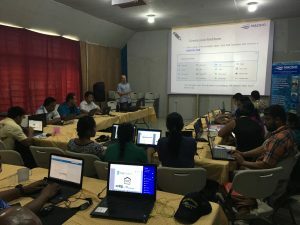 In this context, the MACBIO project that assists its partners in effective approaches of marine management, was requested in 2015 to support data collection on locally managed marine areas in Fiji – in particular with the design and development of open-source mobile solutions. Thorough research and testing of existing platforms and proven examples identified Open Data Kit (ODK), as suitable free and fully open source solution – especially in combination with KoBo Toolkit. Beyond this, MACBIO aims at collaborating with national and regional stakeholders to develop lasting solutions and standards for the use of open-source mobile applications in support of sustainable marine resource management and conservation.